Elenice da Cruz de Castro, known by her friends and family as Nice, resides with her daughter and husband along an uphill path in São Gonçalo, a city just to the east of Rio de Janeiro. On a weekend afternoon, the base of the hill is noisy with the commotion of people and music. Uphill, Nice’s house is quieter, with a peace disturbed only by the occasional cuckoos of her rooster and shouts from neighbors. From her rooftop, you can see the buildings and streets of the city that lie between her hill and the one opposite. Nice is living with hepatitis C, a disease she contracted in 1984. She rarely leaves the house, and when she does it is usually to see the doctor. She passes much of her time working on arts and crafts, many of which she creates with various objects in the house. She makes a decorative box by tearing apart thin layers of paper napkins, cutting out their floral designs and pasting them onto pieces of wood. She animates a teal picture frame with glued bits of white eggshells. 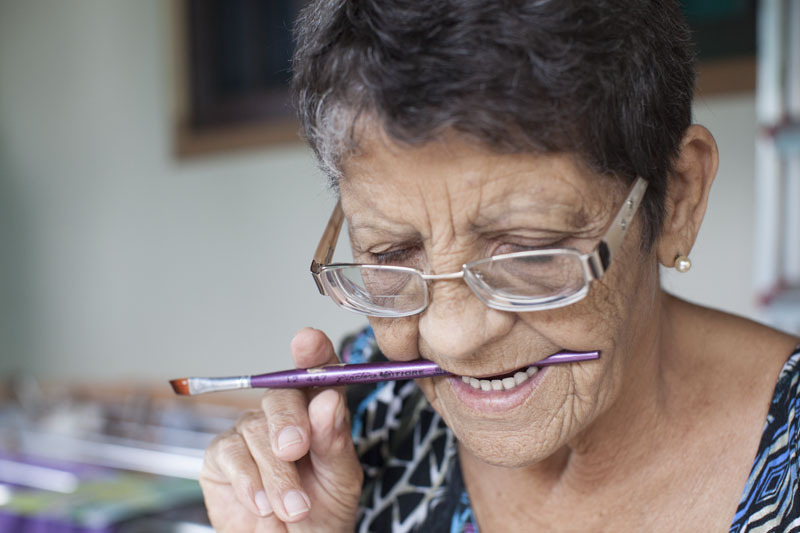 Elenice da Cruz de Castro, age 67, lives in São Gonçalo, Rio de Janeiro. She is a Hepatitis C patient who has chronic liver cirrhosis, only treatable with a liver transplant. She has been married to her husband Jayme for 50 years. They have three children and one of the daughters Vera lives with them. In 1990, she started suffering from ascites - her stomach swelled up with fluid for two to three days. This happened to her every year. In 1996, she went to go see a gastroenterologist, who had no solution for her. She changed her diet but the painful ascites still came back every year, making her very weak. She became forgetful and confused, walking around her neighborhood without proper consciousness. She was suffering from encephalopathy, a disorder in the brain when the liver cannot function correctly – one of the symptoms of Hepatitis C.
At Hospital Antonio Pedro, she received the news that her Hepatitis C was in the chronic stage, and her liver would not be able to take the interferon treatment. She believes that if the public health doctors had examined her more carefully and diagnosed her much earlier, she would not have developed chronic liver cirrhosis. She receives most of the information on Hepatitis C from the support group Amarantes. How to live with it on a daily basis and the consequences of the disease. She used to love to go out and be active, but now she feels very limited in her home. She passes the time doing crafts. Most of the time, she is overcome by fatigue. She must muster up the strength to wash and cook rice. Her only option for recovery is a liver transplant at the federal hospital St. Francis Xavier. In 1984, Nice was in a terrible car accident. Her left leg was badly damaged, and she needed a large blood transfusion. Since donated blood wasn’t screened for hepatitis C until the early 1990s, she believes this is how she contracted the disease. She now has chronic liver cirrhosis, which can only be treated with a liver transplant. Since October 2013, she has been waiting for a liver. Nice also eventually developed liver-induced encephalopathy, which obstructs the brain from properly functioning. She became increasingly forgetful and confused. While looking at mundane objects, everyday items like forks and plates, she could not recall what purpose they served despite knowing what they were. After having a brain scan analyzed by a geriatrician, Nice was told that millions of neurons had died in a small region of the right side of her brain – causing permanent damage. She underwent treatment to recover as much function as possible, but for a number of years she continued to suffer from the encephalopathy, getting lost in her own neighborhood and being unable to remember the names of people she had known for years. For a while, her daughter had to bathe her and assist her with lifting objects such as eating utensils. The consequences of the car accident, contracting hepatitis C, and the ignorance of the doctors she saw not only resulted in a loss of physical health, but they also led to a loss in lifestyle. She used to love going for long, outdoor walks at places like the Jardim Botânico in Rio de Janeiro. She also used to dance to pagode, a style of samba. But now her legs do not feel strong enough to do either of these things. Her condition also made it difficult to work, and she had to take a seven-year leave from her cleaning services job until she retired. The stress of dealing with these changes led to insomnia, heightened sensitivity and depression. One day, in 2006, Nice suffered from a particularly harsh ascite. In a matter of hours, her skin began to look yellow, she felt nauseous and her memory was failing her. Rather than returning to one of the municipal gastroenterologists, Nice decided to spend 50 reais to receive a consultation at a private clinic. 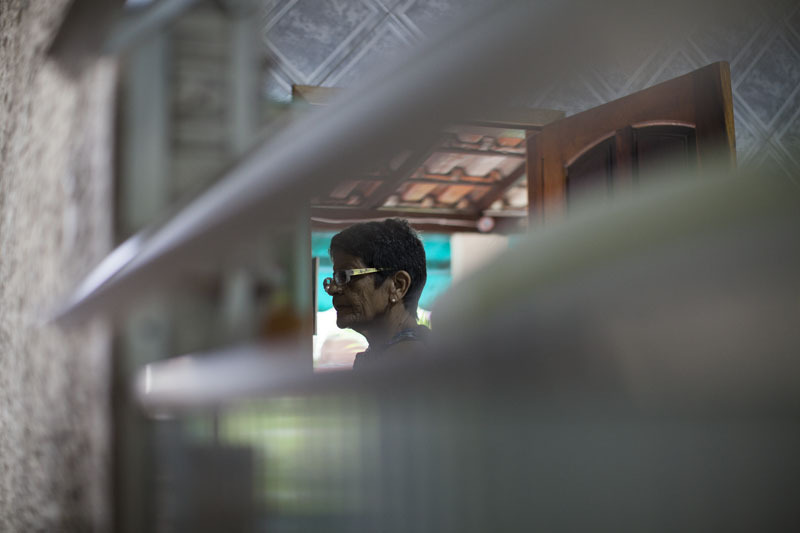 The doctor there sent her to Antônio Pedro, a federal hospital in Niterói where she was told she had hepatitis C and irreversible liver cirrhosis. Twenty two years after contracting it, Nice could finally identify the disease that had caused her so much pain. Nice also received a great deal of care and support from her friends and family. Her daughters were integral to her management of hepatitis C as they took care of messy details and appealed to the doctors on her behalf. And soon after she received her accurate diagnosis, Nice joined Grupo Amarantes. Amarantes provides her with both information on the disease and a support network of people facing similar challenges. “If one of us gets sicker, group members will call and cheer us up and visit us at home,” says Nice. A liver transplant is now Nice’s only option. To learn the specifics of the transplant process, she had to continuously ask medical professionals until she was given an answer. While learning that there is a high degree of uncertainty associated with the operation and a chance that the surgery itself could cause hemorrhaging both during and after the procedure, a successful surgery also means a prolonged life. Despite the risks, Nice is confident that she will be part of the majority of patients who receive successful liver transplants. She is just waiting for a phone call telling her that a healthy liver is ready. She already has one great-grandson, but that’s not enough. After her grandsons get married and have their own kids, she takes it as a point of pride that she will be able to witness an entire fourth generation of her family. Elenice da Cruz de Castro, conhecida por seus amigos e familiares como Nice, reside com a filha e marido em um caminho morro acimaem São Gonçalo, uma cidade a leste do Rio de Janeiro. Em uma tarde de fim de semana, a base do morro é barulhentaem função da movimentação de pessoas e pela música. 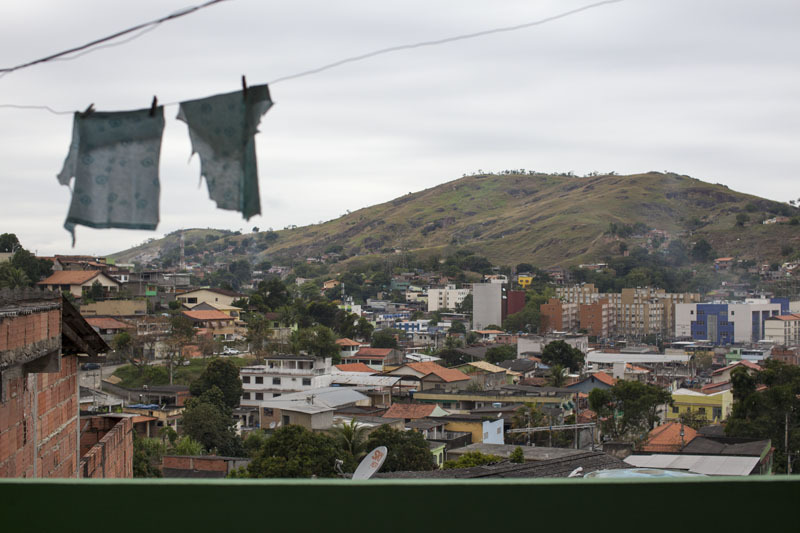 Em cima do morro, a casa de Nice é mais tranquila, com uma paz perturbada ocasionalmente pelo canto de seu galo e gritos dos vizinhos. Da cobertura de sua casa, é possível ver os edifícios e ruas que se encontram entre os morros da cidade. Nice temhepatite C, doença que contraiu em 1984. Ela raramente sai de casa, e quando o faz geralmente é para ir ao médico. 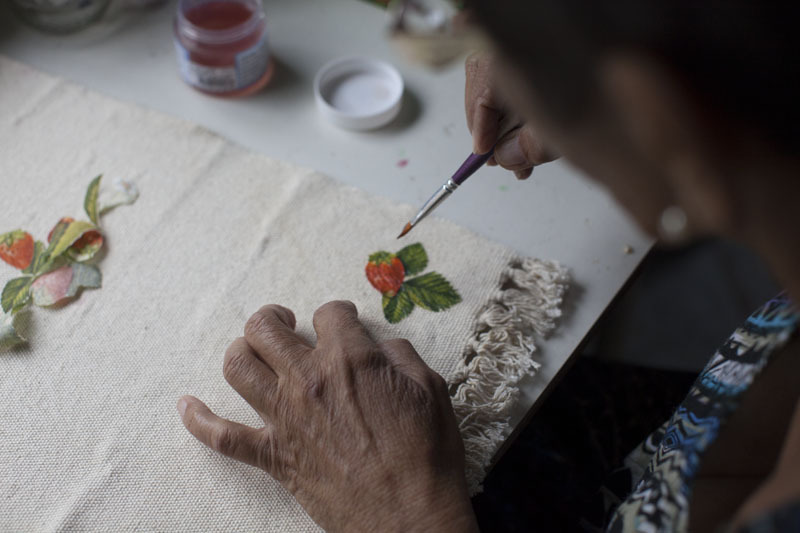 Ela passa boa parte de seu tempo trabalhando com artesanato, muitos dos quais ela cria utilizando objetos que tem em sua própria casa. Ela faz caixas decorativas colando em pedaços de madeira camadas finas de guardanapos de papel cortados em formato de flor. Ela dá vida a um porta retrato colando pedaços de cascas de ovos brancos. Em 1984, Nice sofreu um terrível acidente de carro. Sua perna esquerda foi bastante danificada, e ela precisou passar por uma transfusão de sangue. Comoaté o início dos anos 1990 o sangue do doador não eratestado paraem hepatite C, ela acredita quefoi devido a esta transfusão que contraiu a doença. Atualmente, Nice tem cirrose hepática crónica, que só pode ser curada com um transplante de fígado. Desde outubro de 2013, está à espera de um fígado. Os efeitos da hepatite C começaram a aparecer em Nice no ano de 1990. A princípio ocorria uma leve indigestão, mas piorou progressivamente quando ela teve sua primeira ascite, um sintoma da cirrose que faz o estômago inchar com líquidos e deixa o paciente pálido e fraco durante vários dias. Ela fez mudanças drásticas em sua dieta para tentar resolver o problema, mas a ascite voltava a cada 1 ou 2 anos. Esta irregularidadeno aparecimento da ascite se tornou normal para Nice. Durante seus melhores dias, um médico certa vez lhe disse: "O vírus está dormindo, mas às vezes ele acorda e vai para um passeio com seus amigos através de seu sistema sanguíneo." Durante anos a hepatite C de Nice não tinha sido diagnosticada, ainda que ela tenha consultado vários gastroenterologistas da rede municipal de saúde em São Gonçalo. Eles não foram capazes de identificar os sintomas como indicadores da doença, e, muitas vezes, relacionavam o problema como sendo consequência da ingestão de antibióticos após seu acidente de carro ou também em função de uma vesícula biliar inflada. Nada do que era prescrito impedia a ascite de voltar, e muitos médicosderam conselhos incorretos. “Quando eu via que não estava funcionando com um [gastroenterologista], eu pulava para o próximo”, diz Nice. "Mas todos eles diriam a mesma coisa. Ninguém mencionou especificamente hepatite". Nice, também acabou desenvolvendo encefalopatia induzida pelo fígado, o que impede o cérebro de funcionar corretamente. Ela tornou-se cada vez mais esquecida e confusa. Enquanto olha para objetos de uso diário, como garfos e pratos, ela pode não se lembrar sua finalidade, apesar de saber o que são. Depois de ter seu cérebro analisado por um geriatra, foi descoberto que milhões de neurônios de Nice tinham morrido em uma pequena região do lado direito de seu cérebro - causando danos permanentes. Ela foi submetida a um tratamento para recuperar o máximo possível de funções de seu cérebro, mas continuou a sofrer com a encefalopatia ao longo dos anos seguintes, se perdendo no seu próprio bairro e sendo incapaz de lembrar os nomes de pessoas que ela conhecia há anos. Por um tempo, sua filha teve de banhá-la e ajudá-la com o levantamento de objetos, como talheres. O acidente de carro, com consequente contração da hepatite C, e a ignorância dos médicos, não só resultaram em perda da saúde física, mas também levou a perda do estilo de vida de Nice. Ela adorava fazer longos passeios ao ar livre em locais como o Jardim Botânico, no Rio de Janeiro. Também costumava dançar pagode, um estilo de samba. Mas, agora, suas pernas não são fortes o suficiente para fazer qualquer uma dessas coisas. A saúde debilitada tambémdificultou o trabalho, fazendo com que Nice tirasse uma licença de sete anos de seu emprego na área de limpeza até que ela se aposentou. E o estresse de lidar com essas mudanças levaram à insônia, sensibilidade aumentada e depressão. Nice se recuperou gradualmente dos sintomas da encefalopatia e está lidando melhor com seus problemas de saúde. Isto lhe permitiu reunir forças para participar de eventos familiares, como casamentos e chás de bebê. E apesar de não costumar sair de casa, ela não deixou a doença impedi-la de visitar sua irmã na cidade de Curitiba e, em seguida, no estado de Pernambuco, a mais de dois mil quilômetros de sua cidade. "A sua rotina diária muda, e você tem que aceitar isso", diz Nice. "Mas isso não significa ficar num canto dizendo, 'Oh, eu estou doente, por isso esta é a forma como tem que ser'. Não, não é assim que tem que ser. Você tem que habituar-se, sabendo que está vivo e que a vida continua. " Em 2006, de Nice sofreu uma ascite particularmente dura. Em questão de horas, sua pele começou a amarelar, Nice sentiu-se enjoada e sua memória estava falhando. Ao invés de retornar a um dos gastroenterologistas municipais, Nice decidiu gastar 50 reais para passar por uma consulta em uma clínica particular. O médico a encaminhou para o Antônio Pedro, um hospital federal em Niterói, onde foi diagnosticadacom hepatite C e cirrose hepática irreversível. Vinte e dois anos após contrair a doença Nice pôde, finalmente, identificar a doença que lhe havia causado tanta dor. Com a hepatite C em fase crônica, Nice não pôde começar o tratamento padrão de interferon para tentar curá-la. Ela começou a receber tratamentos em hospitais federais que estão muito melhor equipados do que os centros de saúde municipais. Para ajudar com a ascite, começou a tomar diuréticos para aumentar a excreção da água de seu corpo. Apesardos diuréticos ajudarem, eles deixam seu sistema emocional desequilibrado. "Você vai dormir bem", diz ela, "Mas acorda se sentindo simplesmente horrível." Muitos médicos elogiaram Nice sobre a forma como conseguiu combater a doença ao longo dos anos, particularmente por sua iniciativa própria e persistência. Ela tinha fotos em seu celular da barriga inchada para enfatizar seu caso, e muitas vezes pressionou os médicos a revelar os pormenores de uma eventual doença ou do tratamento, porque o que eles diziam a ela era geralmente pouco claro. Nice finalmente teve a sorte de encontrar os médicos que são responsáveis por ela. "Depois de tudo que eu passei, agora posso te dizer que tive sorte, porque todas as portas em que bati se abriram a mim", diz Nice. "Mas há pessoas que não são tão afortunadas. Eu não sei se é sorte, a forma de abordar o problema, ou a maneira como você fala com as pessoas. Eu só sei o que funcionou para mim." Nice também recebeu muitos cuidados e apoio de seus amigos e familiares. Suas filhas se dedicavam integralmenteao tratamento da hepatite C, além de cuidarem dos detalhes da doença diretamente com os médicos. E, logo depois de receber o diagnóstico preciso da doença, Nice se juntou ao Grupo Amarantes. O grupo fornece informações sobre a doença e tem uma rede de apoio a pessoas que enfrentam desafios semelhantes. "Se um de nós fica mais doente, os membros do grupo vão ligar para nos alegrar e nos visitar em casa", diz Nice. Atualmente, um transplante de fígado é a única opção de Nice. Para saber precisamente os detalhes do processo de transplante, ela teve que pedir continuamente orientação aos profissionais médicos, até que lhe foi dada uma resposta. Assim, descobriu que enquanto existe um alto grau de incerteza associado a operação, em função da chance de a cirurgia causar uma hemorragia durante e após o procedimento, uma cirurgia bem sucedida também significa uma vida prolongada. Apesar dos riscos, Nice está confiante que vai ser parte da maioria dos pacientes que recebem transplante de fígado em operações bem-sucedidas. Está apenas esperando por um telefonema dizendo que um fígado saudável está pronto. Ela já tem um bisneto, mas isso não é suficiente. Depois de seus netos se casarem e terem seus próprios filhos, ela consideracomo forma de orgulho ser capaz de testemunhar toda uma quarta geração de sua família.